Intellectual Growth research papers look at the four stages of intellectual growth in the human lifespan. It is an obvious fact of life that human beings physically grow from birth until late adolescence. However, human beings also have the capacity for lifelong intellectual growth. Intellectual growth involves the expansion of knowledge to the point where the individual can apply reason, also known as judgment, to a situation. According to psychologists, there are four stages of intellectual growth in the human lifespan. The first stage is dependence, in which knowledge comes from authority and the world is frequently seen in terms of black and white. Individuals then mature into the emergence stage, in which authority is supported by a growing sense of reason in the individual. Learning then comes about by the ability to search for answers. The third stage in independence, where knowledge is gathers through reasoning and the individual’s understanding. Here people have learned enough to understand how to think. The fourth stage is interdependence, where the individual can evaluate situations and knowledge. Intellectual growth allows the individual to move from a simple concrete understanding of the world to one that is abstract and complex. Locke's Theory of Knowledge research paper - Locke's theory of knowledge research papers detail his Essays. Jean Piaget Stages Research Papers look at Piaget's theory of development and discuss the four stages. Piaget Theories research papers discuss Piaget's extensive studies in cognitive development. Piaget Assimilation Research Papers discuss Piaget's theory on education and learning, and examine the process of assimilation performed by students. 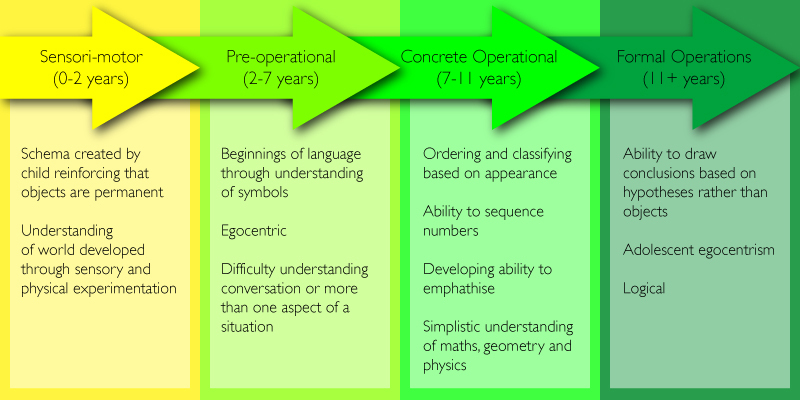 The Origins of Intelligence in Children - In Jean Piaget's book, The Origins of Intelligence in Children, (1952), he also suggests that this cognitive development in children in of a biological nature. Paper Masters writes custom research papers on Intellectual Growth and look at the four stages of intellectual growth in the human lifespan.